Photographers have a lot of pet peeves. For those of you unfamiliar with the expression, a “pet peeve” is something specific that is particularly annoying to you. The list of pet peeves among photographers is so long that you could literally write a doctoral dissertation on the subject. But, generally, anything that can ruin a picture is included. Without a doubt, “foggy lenses” makes the top ten list. This is because it takes quite awhile for lenses to un-fog in humid conditions…. sometimes 20 minutes or more. Lenses become foggy when you go from a cool environment (such as an air-conditioned vehicle) to a hot, humid environment. This scenario is not uncommon in photo shoots where you are jumping out of a vehicle to shoot a scene. Lenses can also fog up in very wet or humid environments, even if the camera had already adjusted to the outdoor temperature. This is common when you are shooting in the rain or next to a waterfall. 1. Shut off the air-conditioning prior to the shoot. When on the way to photograph in a warm area, I try to get the environment in the car similar to the environment outside. Opening the window and dealing with some heat or humidity is well worth it. 2. Control the lens temperature with your camera bag’s zipper. If I am stuck in a cool environment and have no control over it, I’ll leave my camera bag zipped. However, if I’ve left an air-conditioned or cool temperature and am now in the car and can keep the car warm, I’ll begin to acclimate my camera and lenses by unzipping the camera bag slightly. 3. Use the air blower and lens cloth. If your lens is already fogging up, then using your air blower and lens cloth between shots to keep the lens as dry as possible is your best option. Sometimes, you are in a situation where the environment is so wet and humid that these techniques don’t solve the problem. During my recent visit to Iceland, I was photographing waterfalls close up and was getting pummeled with spray from the falls almost constantly. I was battling both water drops and fog on the lens. In those cases, you just do your best to keep the camera dry between shots and wipe the lens after each shot. Using this technique, I was able to get the pictures I wanted, but I did end up with moisture in the lens that lasted until the following day. Another photographer was photographing the same waterfall and ended up with actual water in his lens because his camera and lens did not have sufficient weather sealing. So, you need to be extra careful if you do not have a higher end camera and lens with good sealing. 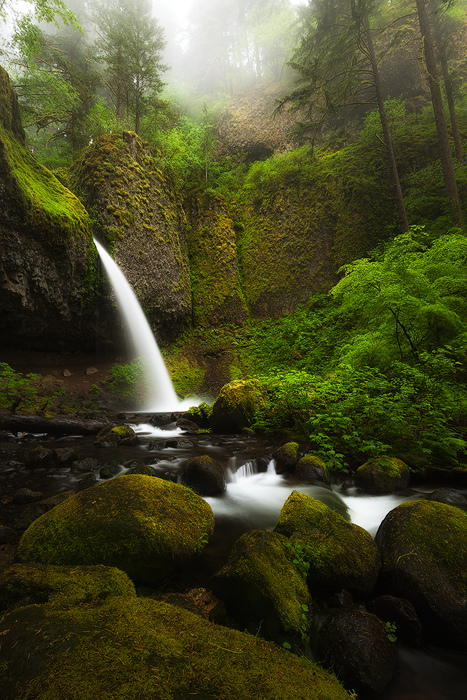 Posted in Shooting Basics, Tips and Tricks on October 6, 2015 October 6, 2015 by Ken Koskela. ← Previous: "Packing for a Photography Backpacking Trip in Iceland"
When photographing around salt water bodies, I find it indispensable to carry a small bottle of commercial eyeglass lens cleaning solution. 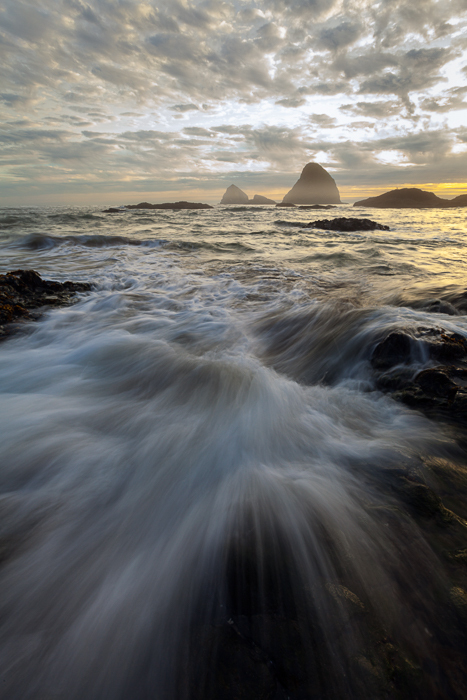 Unlike fresh water conditions, the spray and mist from salt water will inevitably end up leaving a “greasy” film on the front element of the lens or filter. No amount of wiping will remove the smear but a quick blast of lens cleaner will buy you some time until the cleaning cloth becomes too saturated. It pays to come prepared with a half dozen micro-fibre cloths and rotate through them during the shoot. Sometimes fog or mist will subtly reduce image contrast as moisture deposition can form a very fine coating on the front lens element. It may not be readily visible to the eye but becomes apparent once the front element is wiped and the before and after jpegs are compared on the LCD. Under those shooting conditions, I will often periodically wipe the front element just to be sure, even if it looks perfectly clean. I’ve been surprised on many occasions that image quality wasn’t optimized as I failed to appreciate hard to detect build-up that was occurring. Using a lens hood even in overcast conditions is also useful to reduce moisture build up on the front element. Finally, I try to keep my lens either pointed down to the ground or facing away from a source of water as much as possible when not shooting. Shooting at the ocean with an incoming tide and it’s resultant mist is guaranteed to result in deposition of moisture on the front of the lens so one must remain cognizant of this problem and wipe down the front element frequently. Great advice here! Yes, salt water brings in a whole dimension. Agree on wiping off the lens even if you don’t necessarily see the coating of moisture. Thanks very much for the great comments. Keep on top of Ken's latest blog posts, new images, upcoming workshops, promotions and other news.